Think globally … act locally. This Norman Rockwell painting first appeared on the cover of The Saturday Evening Post in 1953. 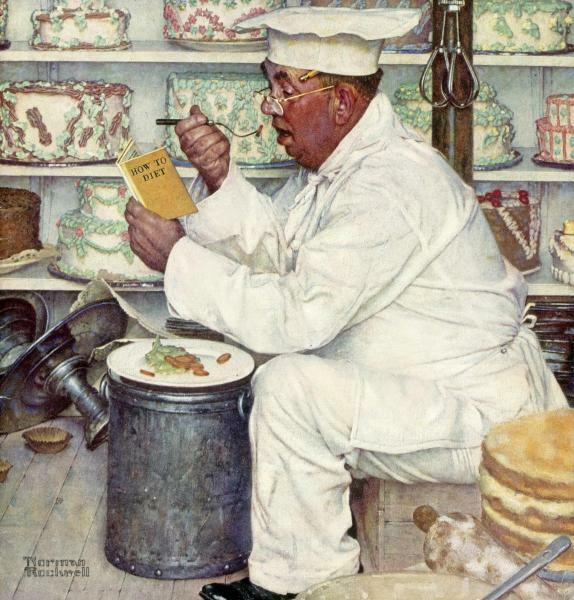 After nearly sixty years it still has the poignant quality of Rockwell’s best work … he knew us all so well, and his gentle portrayals of personality and temperament are as valid now as then. This poor man, obviously struggling with a weight problem… or should I say obesity problem… is doing his best, is doing what we all try to do. He gathers information and then uses it to motivate or reinforce needed changes in behaviour. He ignores nearby temptations and uses his willpower to focus on his goal. He suffers sensory privation, accepting less of what is obviously less appetizing . We wish him well. We also know that he will fail. Because he hasn’t been able to change his culture and environment, to eliminate the factors that created the problem in the first place. He obviously loves his work and is very good at it. To succeed in his diet, he would probably need to change jobs, change friends, change his lifestyle, change his personality. How many of us would have the courage to do that, would be able to carry it off successfully? We like to believe that good advice, self-help literature, and personal determination can help us change. Then we blame ourselves when it doesn’t. The struggling pastry chef has my best wishes and profound condolences. I know how he feels… and I suspect many of my readers do also. I have too many books… the bookcases are double stacked and there are piles accumulating in the corners. Yet I buy more. I cull the collection periodically, give favourites to my friends, donate to charities, try to follow the one-in-two-out rule I set for myself. It doesn’t help much, and I know that if I had a bigger house, it would just be a bigger problem. I am a quilter and needleworker. The storage area is overflowing with an assortment of wonderful fabric and fiber and tools. Last week a friend who is trying to clear out her “stash” brought some pieces to a gathering… I brought home three pieces! They still sit on the desk, mocking me. I had a dream, a plan, a purpose for everything I bought. I could never live long enough to use it all up, but how can I give/throw it away? It is like getting rid of those creative dreams! The closets are overflowing… in our climate in Southern Ontario we need clothing for the extremes of four seasons… it takes restraint and careful management not to accumulate too much, especially if you like variety and fashion. I read no fashion magazines, avoid the ads, stay out of the malls. I work very hard on both restraint and careful management, but despite my best intentions, the closets are still overflowing. Extrapolate this to the global concerns we have been discussing recently. I think the whole world has reached the point of being too small and having too much. Can human willpower or governmental legislation actually change the way we live if WE cannot change the way we live, here in our own homes, one calorie or one purchase at a time? But it is so very, very, hard! This entry was posted in Uncategorized and tagged art, behaviour, choice, environment, personality, society. Bookmark the permalink. 2 Responses to Think globally … act locally. I agree with your wiseman. This chef is obviously a very good cook. It is sad that he does not seem to be enjoying it any more!